After waiting more than four months finally webmasters along with Blogger can smile because Google has rolled out the Last Foremost PageRank update of the year 2012. As soon as the month of November got underway, the hearts of webmasters were overflowing with enthusiasm because they were expecting an enormous increase in the Page Rank keeping in mind the number of backlinks they have created. However, Google prove itself to be the greatest villain of the internet yet again by pushing Panda 21th Update that literally killed all the passion which was revolving in the blogosphere. According to our sources, PageRank update is still under progress because lots of websites saw an increase in the PageRank of internal pages while the PageRank of Home Page remains unchanged. Today we will answer some priceless questions about PageRank. Many webmasters were expecting that their site will attain a High PR, but things never went according to the expectation. When a person works with dedication and all of sudden Google Slaps on his face then, no one can imagine the pain that a webmaster feels. However, we should Never Give up Blogging because one who remains firm always wins the race. Following is the PR Report of some top quality websites. Does a High Page Rank Help’s In SERP Ranking? If you are thinking that Page Rank Helps in SERP Ranking, then we will suggest you to think again? Those days are part of history when Google use to rank websites on the basis of PageRank. However, now it has nothing to do with Search Engine Ranking because it solely depends on the Quality of content and the Authority of a website. Ranking is a vast term which has lots of branches, and PageRank is a small part of it. A Person may eyewitness lots of websites with High PageRank, but they never receive a decent SERP Ranking. This doesn’t mean that High PageRank websites always gets low Search ranking because high PR is the mark of professionalism. How To Get a High Page Rank? People do get overexcited by observing some High PR Website. Some websites Like Twitter, Facebook and more has a splendid PR (PageRank). Why? These websites are the pioneers of the internet. Some top quality sites talk about them and sends them a link which helps them to attain a High PR. Its quite clear that a Decent PR solely depends upon the number of backlinks no matter how you get them. Moreover, those backlinks should be from high quality websites because creating incoming links from low quality websites wouldn’t benefit much. How To Check Page Rank? There are numberless ways through which a person can check his PR. Though, we use Google Chrome's PR Checker Plugin but you can also utilize an online PR Checker that words perfectly. Follow the Following instructions. Press Verify Now Button and your PR will be displayed. First PR Update on February, 6th, 2012. Second PR Update on May, 3rd, 2012. Third PR Update on August, 2nd, 2012. Fourth PR Update on November, 8th, 2012. Following are the few expected dates for new PR updates. However, they are not 100 percent accurate because it is our estimates. Consider our prediction about PageRank update. Well truly speaking we were expecting to get at least a 3 PageRank keeping the number of backlinks we have got from top quality websites. Well, there is always a next time so one should not get dishearten because even a tallest building was once a tiniest grain of sand. Concentrate on creating quality content and backlinks would be produced naturally. Spending hour on commenting for the sake of getting a backlink is not compulsory. Instead of commenting, work on content. What is your thought about the PR update? Does anyone see an increase in their PageRank? Take a lot care of yourselves till then peace, blessings and happy updating. No change at all.Expecting pr one for my blog mytechpromo.com after getting high backlinks also.But its hard to understand google.Btw finaly waiting is over and mbl is 1st to give this news.keep it up Syed. :( No PR Update For You. I Thought You Would Get 3 At Least This Time. 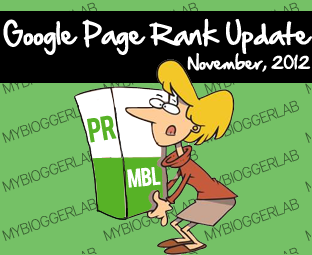 I got Page Rank 0 to 2 That's great :) I think Next time MyBloggerLab will get PR from 3 to 4 . Hi syed. I read your previous post of panda and realized that something went on my website. I receive around 600-650 visits a day. But day before yesterday, i was shocked to see 1,222 visits on my blogger status. But now visitors have fallen again. Is this panda work? Syed bhai Here is a case study for you .My website www.eduways.in is 4 Months old same as of my one friend www.sarkarinokrinews.in . As a full time blogger I give a lot of time to backlinks and blog commenting but that guy even don't know what backlink is . Even my traffic is double from him . BUt still I got PR 1 and his blog got PR 3, Means both of our blogs are just 4 Months old . And PR 3 in 4 months , is it possible ? hey faizan i have sent my guest post plz take a look on it. Whats this why my comment has been deleted?disapponting, there was not any link or spam. Dude! we aren't accepting any Guest posts but when we will accept them! I Will surely publish yours Creation. Hope you won't mind. Yes Saqib, Unfortunately Google Seems be bit Angry with our behavior. LOL, Jokes a part. Lets See when we can achieve from the coming up updates. Dude, You Answered Your Question Yourself. Look, PR has nothing to do with Search Ranking. As you have said, Your Blog has More traffic then the other guy. Well I Think in this update, Google has done unfair with Webmasters by not giving a boost to their PR. OH I am Really Sorry Dude, Your Each and Every Comments are Automatically Going into SPAM. Your Previous comment was also in SPAM Box. Don't know whats Wrong with it. However, I Get Each and every comment notification on my Inbox so I immediately removed it from SPAM Box. @Syed ohh sorry I realised it when my second comment also goes into spam.Well there is no mean for me to be online without MBL and you bro. One blog of mine has been over a month old with no outbound links, but it managed to get to 2! Two of my other blogs got the same ranking, which is pretty not bad for someone with newly bought domains. I was already a 4 before and I'm going at it again hopefully soon. Even i used to think that PR has nothing to do with site ranking when my PR was 0.But in the recent update Google once again proved that sites with good PR get good traffic.There are many algos but PR has high value. Website up for 1 month. Got a PR1. I am so happy. It will update at February 2013 :D.
I got PR3 from PR2. I think you will get high PR if you writing unique content for your site. Hope MBL will get high PR next update.